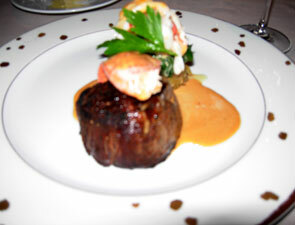 Executive Chef David Walzog is no stranger to steak, or steakhouses for that matter. As corporate executive chef at the Glazier Group, prior to joining the team at Wynn Las Vegas, he was in charge of Michael Jordan's The Steak House NYC, The Steakhouse at the Monkey Bar and three Strip House restaurants, all of which earned many accolades under his direction. Furthermore, Chef Walzog developed Michael Jordan's Steak House brand steak sauce and steak rub, and is also a published author, having penned his own cookbook, The New American Steakhouse Cookbook. Couple those achievements with the fact that Chef Walzog was mentored by such culinary luminaries as Alfred Portale and Mark Miller, and you know that you're in for an exquisite meal at SW Steakhouse. Just don't forget to try one of the side dishes; obviously, steak is a year-round eating enjoyment, but Chef Walzog's sides showcase his seasonal creativity. Service is lovely, although not as personalized as in a more intimate restaurant; servers could not have been nicer and were dressed as elegantly as you would expect at a fine dining restaurant. They take care of your every need. For an exclusive interview with Chef Walzog, please click here. For his biography, please click here. 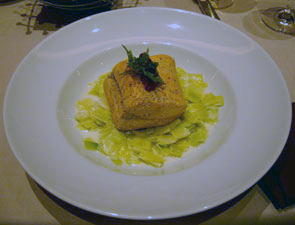 To try one of Chef Walzog's scrumptious recipes at home, in your own kitchen, please click here. Specials: Golden Oscetra Caviar (served with traditional trimmings, brioche toast points and blinis, 30 grams, $200/50 grams, $325); Featured Oysters (Kumumoto, Humboldt Bay, CA - petit, buttery, briny, Skookum, Washington State - sweet, clean, crisp finish, six, $18/twelve, $36); Seafood Spectacular (a chilled selection of the ocean's finest, including Maine lobster, jumbo shrimp, east coast oysters, king crab, tuna tartare and lobster salad, $65); Heirloom Melon and Parma Prosciutto Salad (Buffalo mozzarella, aged balsamic, $18); Chopped Vegetable Salad (spring vegetables, grilled bacon, Roquefort cheese dressing, $16); Japanese Wagyu Beef (NY Sirloin, 7 oz. cut, $175). Starters, Salads, Soups: Oysters on the Half Shell (cocktail sauce, red wine mignonette, MP); Cedar Roasted Oysters (Kumumoto oysters with pancetta, leeks, crème fraîche, $18); Wild Dungeness Crabcake (confit tomato relish, garlic aioli, arugula, $18); Chilled Jumbo Shrimp Cocktail ($20); Kobe Beef Carpaccio (frisee, mache, fried capers, grilled sourdough, sherry vinaigrette, $21); Foie Gras Hot, Foie Gras Cold (seasonally inspired, composed daily, $24); Porcini Mushroom and Sweet Corn Soup (blue crab claw, charred corn, tarragon, $14); Hearts of Butter Lettuce Salad (Cherokee tomatoes, sliced avocado, herbs, Dijon vinaigrette, $14); Caesar Salad (parmesan crisp, garlic-paprika crouton, classic dressing, $14); Red and Yellow Beet Salad (grilled Hen of the Woods, petite greens, aged goat cheese, balsamic, $16); Blue Fin Tuna and Yellowtail Tartar (cucumber, pickled vegetables, wasabi leaves, soy vinaigrette, $22).